Just back from VMworld Europe. 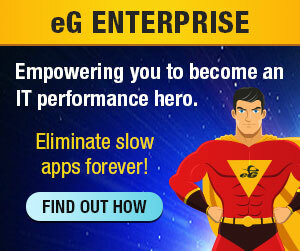 Lots of people had heard about eG’s new VDI monitoring announcement and stopped by our booth to see our demos. While the Europe event had only about 1/3rd the attendance compared to the US event, we ended up with the same number of leads! If you are one of those deploying virtual desktop technology, you will find our new presentation of interest. This presentation explains why the eG VDI Monitor is a must-have solution for any Citrix XenDesktop VDI deployment. Click here to view this presentation. As a reminder, our new VDI Monitoring-on-Tap service is live now and we are offering a free 60 day trial if you are deploying virtual desktop technology and want to see the value that end-to-end monitoring can offer for you.